Heroes, the Coldstream Guards’ first album, went straight to number one in the classical charts when it was released in 2009, and has sold 210,000 copies. The Band's second album, Pride of the Nation, will be released on 28 March. It includes patriotic television, radio and sporting themes as well as traditional favourites like Jerusalem and Zadok the Priest. The Coldstream Guards perform at Classic FM Live at the Royal Albert Hall, London, March 2010. Members of the Band of the Coldstream Guards at the launch of the Classical BRIT Awards 2010 with NS&I. Their album Heroes was nominated for NS&I Album of the Year. The Coldstream Guards stand to attention and try to bear the extreme heat of the day while performing the 'Changing of the Guard' at Buckingham Palace during the summer heatwave of August 2003. The Coldstream Guards on stage at 'Live 8 London' in Hyde Park on July 2, 2005 in London, England. The concert was one of ten simultaneous international gigs including Philadelphia, Berlin, Rome, Paris, Barrie, Tokyo, Cornwall, Moscow and Johannesburg. The concerts preceded the G8 summit. A picture of the The Coldstream Guards' Band with their instruments taken in 1930. It is the nation's oldest serving military band. 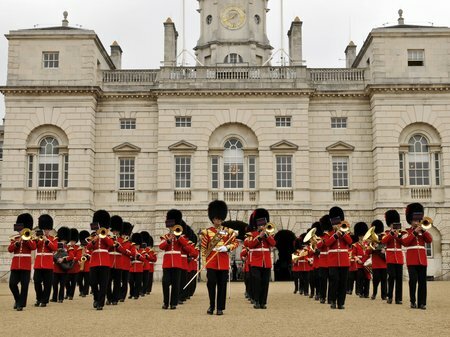 The band of the Coldstream Guards marches along the Mall towards Buckingham Palace for a rehearsal of Trooping the Colour, the Queen's official birthday celebrations. The Coldstream Guards march past The Guildhall before The Royal Wedding of Prince Charles and Camilla Parker Bowles on 9 April 2005. The Princess of Wales' coffin, escorted by Coldstream Guards, near St James' Palace in The Mall on the day of her funeral service, 6 September 1997. Coldstream Guards help one of their comrades after he passed out due to the extreme heat of the day while performing the 'Changing of the Guard' at Buckingham Palace in August 2003. On the parade ground of Wellington Barracks soldiers in the Corps of Drums, 3rd Battalion Coldstream guards rehearse for their part in the 'Welcome Home' ceremonies for Queen Elizabeth II on her return from a Commonwealth tour in May 1954. Taking a break from their official post, members of the Regimental Band of the Coldstream Guards perform the opening fanfare at Classic FM Live in March 2010. Read more about the new album, Pride of the Nation, in the Music section of classicfm.com. We'll be featuring more exclusive Coldstream Guards content in the coming weeks.